Each weighs just ounces, but they'll get you pounds of hunting success. Gobble, gobble... BANG! Realistic Cherokee Sports® Turkey Decoys fool wary gobblers. 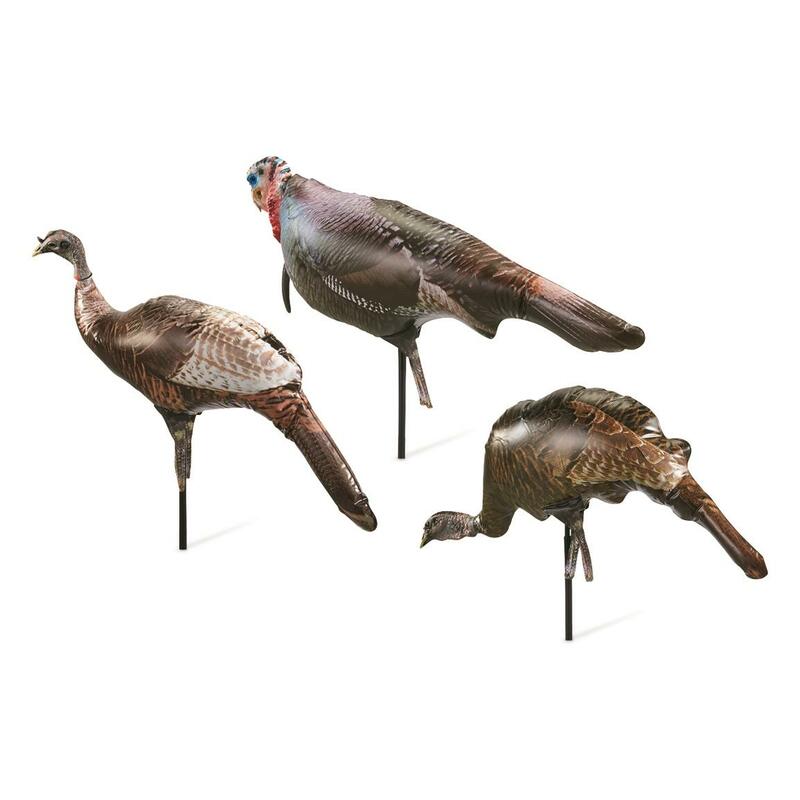 The colorful Cherokee Sports Decoys are ultra portable and inflate fast. Photo-realistic images are printed on outdoor-durable material to make them look like the real deal. In fact, each noggin is molded from a real freeze-dried turkey head. Stake each one and the slightest breeze causes 3-dimensional realism. Includes semi-strut Jake, a submissive hen and a wobble-head hen. Cherokee Sports Flock of 3 Decoys is rated 4.8 out of 5 by 5. Rated 5 out of 5 by George6943 from Great set of birds! Great set of birds at a great price! Rated 4 out of 5 by Hunter22 from Price was right A bit different then the pictures. All 3 decoys have a molded head. They do inflate. I have used these in the past and these are different. Shot 2 nice gobblers using Cherokee decoys in 2018. These are a bit different but sure they will work. Rated 5 out of 5 by Bolshi Midvid from Have not turkey hunted yet. But looks like a great purchase. Turkey call will work. Decoys should do their job. Hunter ability to not be detected still a question to be answered. Highly recommended! Rated 5 out of 5 by STEVE & PATRICIA from They look excellent, can't wait to try them for the May turkey season. 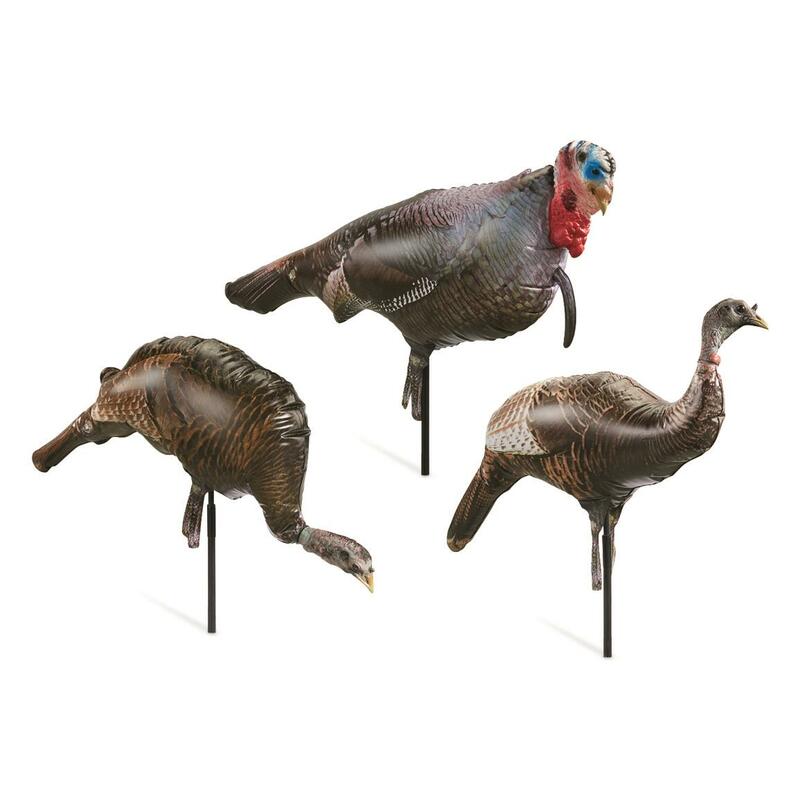 Rated 5 out of 5 by RICHARD from Turkey season of course hasn't opened yet since May 1st is the starting date in NYS,but the price on these decoys was exceptional and the realism of the heads on the turkeys is incredible. The fact that they are inflateable and therefore weigh very little and take up less room in the vest is a real plus. It'll be interesting to see the results of the hunt for 2011! Gives love-sick gobblers the green light. The perfect choice for mid to late season. Smart choice for successful early spring hunts. A little competition brings him in.